The Colorado Department of Human Services continues to provide new information and materials for communities throughout Colorado through the Speak Now campaign. The campaign's latest push is focused on mixed use of alcohol and marijuana. More than 70% of Colorado high schools students reported drinking alcohol at some point in their lives, and more than 40% reported using marijuana making these the two most commonly used substances by teens. Roughly one in eight Colorado high school students reported both binge drinking and using marijuana in the same month. Through qualitative research conducted in multiple Colorado communities, teens indicated marijuana was almost always present at parties where alcohol was also available. Co-use, or mixing these drugs can lead to dangerous levels of intoxication. A new page on mixing has been added to the Speak Now website to provide additional facts and information on alcohol and marijuana. 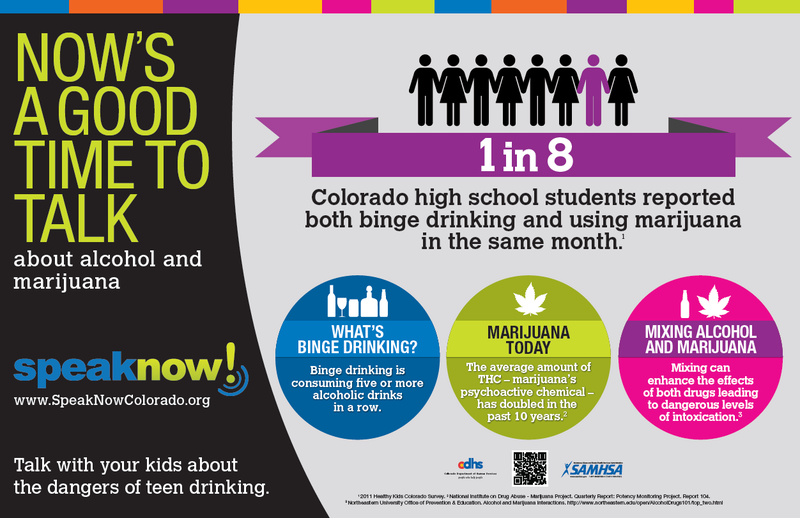 The latest Speak Now poster also focuses on alcohol and marijuana, and the message that roughly one in eight Colorado high school students reported both binge drinking and using marijuana in the same month. In addition, the campaign has produced a new handout outlining the impact both alcohol and marijuana have on teen brain development. Printed versions of these materials can be shipped to you, at no cost to you! Just fill out and return our request form. The Colorado Teen Driving Alliance, with support from state public health, has created an online parent course that provides step-by-step instruction on how to support their teen through Colorado’s Graduated Driver Licensing (GDL) laws, which are designed to phase-in beginning drivers. A link to this can be found on the Speak Now website. RMC Health has developed an extensive library of research-based resources for the community. In collaboration with the Colorado Parenting Matters, the Health and Learning Resource Center Library now hosts a collection of parenting resources available for public access.